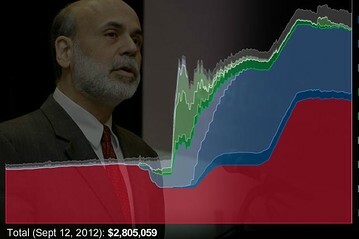 The WSJ has published a nice interactive graphic you can use to study the changes in the Fed’s balance sheet. See the Izzo article for a brief “look inside“. The graphic, created by Real Time Economics, is accessed here (requires Flash). Note that the MBS and agency debt automatically redeem, so the related portion of the balance sheet self-liquidates. So unless the Fed buys some other security, the money supply tightens automatically. MBS have a duration of around six years. I think the agency debt is similar. The longer term Treasury’s also self-liquidate, but in Operation Twist the Fed was buying longer term bonds. Hence longer duration – I’m not sure what the duration is for this part of the portfolio. Most of the other emergency liquidity program assets like the Asset-Backed Securities Loan Facility also self-liquidate depending on conditions. Meanwhile, other assets tied to emergency programs are disappearing. The Term Asset-Backed Securities Loan Facility, or TALF, ended in March 2010, and continues to fall due primarily to voluntary prepayments as the market improves and other financing options become more attractive. Direct-bank lending has fallen to the tens of millions of dollars. The Fed has sold off most of the assets related to the rescue of Bear Stearns and AIG and now just holds less than $5 billion. In an effort to track the Fed’s actions, Real Time Economics created an interactive graphic marking the expansion of the central bank’s balance sheet. The chart is updated as often as possible with the latest data released by the Fed. This entry was posted in Economics, Finance by Steve Darden. Bookmark the permalink.